Thats easy peasy ! 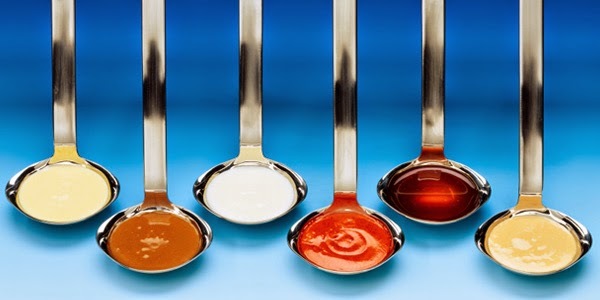 : Saucy Sauces! Sauces don’t always have to be ones you buy in a tin or a pack. When making your own, you know every last ingredient that goes in. Once you got a stocked up cupboard of spices; herbs and stocks, you can create anything. Tinned tomatoes are great to have also. You can bung them in on top of a pot of meat, add them to your Bolognese or use them to create dips. I think they are a great store and you will always find them in our cupboard. However, not everybody likes tomato based sauces or perhaps there might be an allergy issue where you cannot eat them. 1. Place 2 ½ cups water in a large pot. Add about 3 ½ cups sweet potatoes chopped; about 1 ¾ cups/5 medium carrots chopped; just over 2 cups fresh beetroot chopped and 2 garlic cloves. Cook the veg in the water for about an hour until tender. 2. When the vegetables are tender, use a hand blender to puree the mix. 3. Season with salt and pepper. Taste test for flavour. Try it out on for your pasta dishes. Sauces can be created from anything if you use your imagination. Don’t just think that a creamy sauce means pouring in a carton of full fat cream! · And the easiest ingredient – Water! Always taste test everything for more seasoning. There is such a variety of these to play around with here. The most simple thing I love to do with pasta is spaghetti pesto simply by pouring in some home made garlic pesto (see recipe posted previously) to cooked spaghetti and adding shavings of parmesan on top with some fresh basil leaves. Simple but one of my favourites! 1. Heat a good glug oil in frying pan on medium heat. Add to this 2 garlic cloves finely chopped and 1 chilli finely chopped. Fry for 1-2 minutes until softened but not coloured. 2. Add 2 courgettes, trimmed and finely grated. Fry for a further 3-4 minutes or until the courgettes have started to soften. 3. Add 60g/2 ¼ oz parmesan or similar grated cheese and seasoning of salt and pepper. Mix well to combine. Stir in a few spoonfuls of water from cooked pasta and then your cooked pasta. When you’ve cooked your choice of veg and meat for your pasta, add a glug of white wine and reduce. Then you can add either crème fraiche/herb cream cheese/cream to your pot, season with salt and pepper and whatever herbs/spices compliment your pasta dish. Simmer for few minutes and serve over your choice of pasta. This is a basic white sauce base. I make this for my homemade lasagne béchamel sauce. It can be used for pasta carbonara or add some chopped parsley to it for a lovely white sauce for boiled bacon and cabbage. It’s a brilliant sauce to have when seasoned for a lot of different meals. You can also add cheese for macaroni and cheese. 1. Melt 2tbsp butter over low to medium heat and add 2tbsp flour/cornflour. (I use cornflour as it’s gluten free). Add the flour bit by bit whisking it into the butter and cook for a minute. 2. Little by little add in 1 ½ cups of milk making sure to whisk it well to avoid lumps. When all the milk is whisked in whisk well and cook for about 2 minutes on low heat. 3. Bechamel sauce: season with salt and pepper. 4. Mac & cheese: Off the heat stir in grated cheese; salt; pepper; bacon and macaroni. 5. Parsley sauce: stir in fresh chopped parsley, a good handful, and season with salt and pepper. Great for chicken marinade and the best thing is you can make this in advance and it will keep in a lidded container for up to a month. When you want to cook with it, pour it over your meat like chicken and gentle cook it on a griddle pan. 1. Preheat oven to 180°C. Place 6-12 fresh red chillies (depending on how hot you want it) on a roasting tray and roast for about 10 minutes. Cool and roughly chop them. 2. Place chillies; 1tbsp chopped garlic; 1tsp salt flakes; ½ tsp oregano; ½ tbsp paprika; 100ml/3 ½ fl oz olive and 50ml/1 ¾ fl oz red wine vinegar in a saucepan and simmer for 2-3 minutes. Allow to cool, then blend it to a puree in a blender/food processor. This is a French creamy sauce great with any plain meat or fish. 1. Melt 250g/8 ¾ oz butter in a saucepan. Place 1tbsp lemon juice and 2 tbsp tarragon vinegar into another saucepan and bring to the boil. 2. Place 2 egg yolks and splash of water into a blender/food processor. Blend the ingredients together, slowly adding the hot butter to the mix as you go, little by little. Continue to blend until the sauce thickens. 3. Add 1 tbsp fresh tarragon roughly chopped and 1tbsp fresh flatleaf parsley finely chopped to combine. Sometimes I find with just marinading meat in oils; garlic; herbs and spices, gives enough flavour and yummy juices to meat when cooking that I don’t need a sauce. I just crush and combine all these together and pour over the chops in a bowl, cover with clingfilm and marinade in the fridge for an hour or so. When frying the chops the juices are amazing and any leftovers on the pan I pour over when serving. Making a roast dinner with the full works and rich thick gravy is one of my favourite things to do for comfort food. I find making my gravy from all the juices and flavours from the roasting tray and the vegetable water is the best way to achieve a flavoursome gravy. Simply crush 3x garlic cloves in a pestle and mortar with 50g room temp butter. You can roll it up in greaseproof paper in a sausage shape roll and chill. When you want to use it you can just slice off some and lay it over your cooked steak. You can spread it over crusty baquettes and bake for yummy homemade garlic bread. I would use this yummy creamy sauce for things like chicken and mushroom pie. Another nice way to use this sauce is pouring it into a casserole with chicken and cooking in the oven. Yummy with mash. 1. Fry some 1 chopped onion and garlic in some flora cuisine or if you don’t have this then in butter and oil on low heat for about 10 minutes to soften. 2. Add about 25g cornflour/flour, stirring thoroughly to avoid lumps. 3. Gradually add in 150ml milk and 150ml vegetable bouillon/chicken stock whichever you fancy. Obviously the chicken stock will give it that more creamy chicken flavour. 4. Stir continuously to create a thick creamy sauce. 5. For a white wine creamy sauce in chicken and mushroom pie: i would pour this sauce over chicken; mushrooms; salt; pepper and glug of white wine and cook on high heat for 5 mins and then simmer for 5, making sure to stir as not to burn the base. This is then your filling for a pie to be cooked in the oven. 1. In a pester and mortal combine ½ tsp cumin seeds; ½ tsp rosemary; ½ tsp thyme; 2 tbsp olive oil; 1tsp salt and ½ tsp pepper. This can be poured over chicken pieces and cooked in the oven at 200 °C for about ½ hour. 2. In a pan then, I fry up some veggies like carrots; courgettes and mushrooms on medium heat in some oil until soft. 3. Add 2 tbsp white wine (or a good glug!) and cook for 5 mins to reduce. Add to this a chicken stock pot; 1 can chicken soup; salt and pepper. Add in your chicken from the oven and simmer for about 10mins. Another creamy sauce you could create is by using crème fraiche. There are so many flavours now from the original plain to herbs and garlic. You can cook up some meat and vegetables by stir frying. Then adding some crème fraiche; white wine and seasoning, cook on medium heat for about 15 minutes, depending on how you’ve prepared and cooked your meat and veg. 1. Heat 1tbsp olive oil over medium heat. Add fresh root ginger, peeled and finely chopped or just some ginger spice you may have; 2 crushed garlic cloves; 1 large onion finely sliced and fry for about 10 mins until soft but not coloured. 2. Mix in 3 tbsp medium curry paste/2tbsp curry powder; 400ml can coconut milk; 300ml/ ½ pint chicken stock and salt and pepper. 3. Simmer for about 20 minutes. Curry is always a favourite in our house. Whether it’s just to dunk some homemade chips in or making a chicken curry, we love it. To my curry I add chicken; mushrooms; onions; peas and fresh coriander. I cam across some great curry pastes in the Asian English market in Cork city. You just add the paste to your pot and either boiling water for a great Chinese curry flavour or a tin or coconut cream for a more creamy texture. Adding your favourite meat and veg to this, it’s always a treat. 1. when your meat is browned, drain excess fat, return to pot and add 3tbsp flour to coat and mix well, cooking for about a minute, stirring all the time. 2. Add 1 tbsp tomato sauce (omit if allergies to tomatoes); 1tbsp brown sauce; boiling water to cover; 1 stock cube/pot (beef or veg); 2 chopped garlic cloves; salt; pepper; dash of cumin; dash of Worchestershire sauce; thyme and oregano. Simmer through. 3. If you are making stew, add in whatever veggies you want to this and simmer until cooked through. When frying fish, I never use any sauce. 1. I simply take a piece of fish like Hake, season both sides with salt and pepper. 2. Melt butter on a frying pan and place the hake skin side down. Fry for a couple of minutes until the skin is starting to crisp. Add a few more knobs of butter around the pan and cook further until the skin is crisp. Flip over the fish and cook for a further 3-4 minutes. Transfer the fish to warmed plates. 3. Melt another knob of butter to the pan over moderate heat. Then add a squeeze of lemon juice and about 1 tbsp of chopped parsley/chives/tarragon. Swirl to combine and season with salt and pepper. Pour this delicious sauce over your fish and serve. There is such a wide array of products out there at the moment that are amazing. My new addiction is “Nandos” sauces especially piri piri and sundried tomato and basil. I use them for creating saucing in cooking or adding a dollop into mayo and tomato sauce for a kick dip for chips and wedges. These should be a cupboard store in every household. They can be added to anything to create a great sauce or used in dips. They are your main base for Bolognese sauce or add some cream to make a creamy tomato pasta base. They are great in a base for fajitas and Mexican wraps also. They are also great in paella type pots; sausage casseroles and one pot wonders! I create these all the time by add rice to the pot and boiling water until the water has absorbed and left you with a wonderful tomato and rice pot wonder. Tomatoes can be tweaked with your own flavours and spices or herbs to create a different dish everytime. So there you have it, hope there is something here for everyone to get a little inspiration about different sauces for different ideas!